A lease that creates a farm lease agreement suitable for terms between 6 months and 60 years. There is strong protection for the lessor with 62 lessee's covenants, but the lessee is treated fairly. 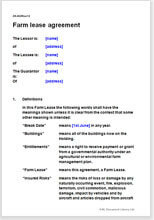 This lease creates a farm lease agreement. It is comprehensive with a choice of 62 positive obligations and restrictions on the lessee to ensure that the land is used as the lessor wishes. The term of the lease can be between 6 months and 60 years with regular rent reviews. This document complies with property law. If the circumstances of occupation suggest that the character of the tenancy is primarily agricultural. “Agricultural business” refers to using all or part of the property to grow plants (crops) or rear animals with a view to sale. The scale of the business is not important: the same tenancy laws apply whether the property is a commercial dairy farm with hundreds of acres of pasture, or 10 metres of poly-tunnel under which a prize garden plant is cultivated. Change of use may be anticipated and will not necessarily disqualify the agreement, if notice has been served. The lawdoes not make clear how far diversification may go. However, it has now become clear that peripheral or additional business operations will not prevent a tenancy from being a farm lease, for example, operation of a farm shop or a camp site. In any case, any diversification of use other than farming is likely to require the consent of the lessor. A mushroom grower using one of the outbuildings to develop a new breed for commercial sale. This lease comes with a menu of over 62 options to empower or restrict the lessee. The terms have been carefully considered to protect the lessor's interests while remaining fair to the lessee. Schedule 3: lessee's incoming fixtures.